Air duct cleaning in Michigan is a niche market and requires the proper equipment and knowledge to perform honest and thorough cleanings. Amistee Air Duct Cleaning has been servicing the Metro Detroit duct cleaning market since 2004. In order to keep up with the demand of its clients, Amistee Air Duct Cleaning in Michigan recently moved to a larger facility. In the new headquarters, Amistee will be able to offer state of the art training with an in house training facility similar to a small house. In this duct cleaning training facility, Amistee duct cleaning employees will be able to practice certain techniques and NADCA (National Air Duct Cleaning Association) methods to properly clean ventilation systems. If you would like to know how Amistee can improve your homes air quality through a comprehensive air duct cleaning, call 248-349-8877 today or email info@amistee.com. 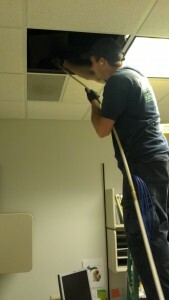 Air duct cleaning in Michigan is important but only if done properly. Don’t be fooled by companies who offer “This week only” specials that run 52 weeks out of the year to lure you in. 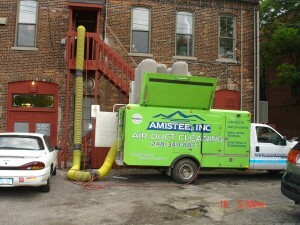 Amistee Air Duct Cleaning located in Michigan has cleaned over 17,000 Michigan homes air duct systems. Call Today! The National Air Duct Cleaning Association (NADCA) says that a standard air duct cleaning should cost anywhere between $500-$600 across America. The reason NADCA came out with this statement was to educate consumers about scams and have them think twice about the $79.99 specials for air duct cleaning. When air duct cleaning is done correctly in Michigan it can make a significant impact on your health and well being. You will potentially have to do house keeping less and your furnace will be able to operate smoother. When choosing an air duct cleaner it is important to look on an air duct cleaning companies track record and reputation. Amistee stands behind honesty and integrity. At Amistee, our pricing structure is set up to give flat rate honest pricing. One of the first questions potential customers want to know is “how much air duct cleaning costs”. When choosing Amistee as your air duct cleaning firm you will get a professional air duct cleaning where the pricing will never change upon arrival. You do not need to worry about any bait or switch scams or gimmicks when getting the cost for air duct cleaning. 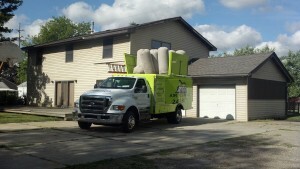 Call today to find out the air duct cleaning cost for your Michigan home. Call 248-349-8877 to speak to a trained air duct cleaning professional. 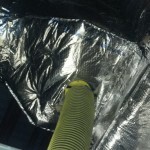 Cleaning your homes air ducts in Michigan does not have a specific time of year that is better than any other. In Michigan we use our air ducts to deliver heated or cooled air (depending on the time of year) in the winter, spring, summer and fall. Because of this the air ducts in MI are always pulling in air to the furnace and then redistributing the same air into the living space no matter the time of year. Most people think that cleaning residential air ducts in MI should only be done in the summer time or when it is warm out. This is the furthest from the truth. Cleaning air ducts is very important in the winter months because this is when you spend most of your time indoors with your home sealed up. You are breathing the same air over and over. Whatever is in your air ducts is what you are breathing. House duct cleaning in Southeast MI can improve your indoor air and remove the dirt and debris from your heating and cooling ventilation system. Call Amistee Ductwork Cleaning today at 248-349-8877 and find out why we are rated one of Michigan’s best air duct cleaners. Heating Duct Cleaning MI should be done year round. 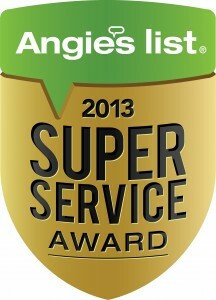 As 2013 comes rushing in, Amistee Air Duct Cleaning is happy to announce that it has received its 4th straight award for Super Service through Angie’s List. Amistee has been a large part of Angie’s List since it first launched in the Metro Detroit area for air duct cleaning 5 years ago. 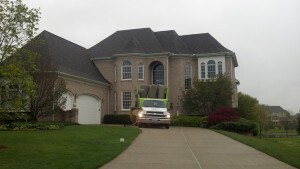 Amistee Duct Cleaning in Southeast Michigan takes pride in quality air duct cleaning and offering exceptional service for its air duct cleaning and insulation customers. The Angie’s List duct cleaning customers speak for themselves through their reviews. There is a reason Amistee has over 80 A+ ratings on Angie’s List. Call today at 248-349-8877 to find out why! When it comes to cleaning the heating and cooling ducts in your facility your choice is simple. Amistee Air Duct Cleaning offers professional services to your building staff and owners at a higher level. HVAC system cleaning is a specialty that many flounder on. Amistee is highly qualified to perform your buildings air duct cleaning in a timely, efficient manner showing knowledge in VAV Box cleaning, lined ductwork cleaning, spiral duct cleaning and many many more. Call Amistee Air Duct Cleaning to have a team leader contact you to provide you with on time service with a commitment to quality. Call 248-349-8877 today. Amistee Duct Cleaning MI services all of Michigan for its commercial clients including but not limited to Metro Detroit, Flint, Saginaw, Lansing, Grand Rapids and Traverse City air duct cleaning. How do you choose the best duct cleaner, or contractor? Many people think that it is easy to find good companies or people to perform the work they need done. It is simple right? Find out what type of service you want completed (duct cleaning, carpets cleaned, drywall work done, paint ect…) and then call someone that seems good and pay them. Many homeowners get taken advantage of when they take this approach to air duct cleaning. It is very important to go with a company that focuses on air duct cleaning and has been doing it for a long time. A great way to check if you are choosing a reputable company is going to www.bbb.org and typing in the company name to check their history. If there have been complaints over the years than you may want to think twice about choosing the firm to perform you duct cleaning in your Michigan home. Do some internet searches for the company that you are thinking about hiring.. See what comes up and what types of reviews the company has. A great resource that is very true is a service called Angies List. 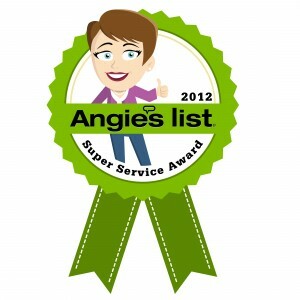 (www.AngiesList.com) This is a service where members subscribe and pay a yearly fee to see a list of contractors in many different fields that have real reviews by real customers. If you look, Amistee Air Duct Cleaning has far more reviews than any air duct cleaner in Michigan or duct cleaner in Metro Detroit. Amistee is focused around the customer and it shows in our past customer history. We have performed over 10,000 air duct cleanings in the Metro Detroit including duct cleaning in Ann Arbor Michigan. Along with Amistees long history with the residential market, Amistee has cleaned commercial air ducts in Michigan for the Michigan State Police, Best Buy, School Districts, and many hospitals. Please do not get taken advantage of. You work hard for your money just like we do. Do the proper research and if you have any questions please call our helpful team at Amistee. We are here to help. Call 248-349-8877 or email info@amistee.com with any questions.